Make your look more attractive and classy with this designer looking women mini leather dress. 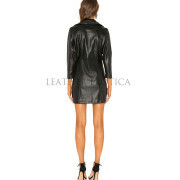 This women leather dress is uniquely crafted from real lambskin leather. This designer looking women leather dress has front exposed zipper closure and classy notch collar which will make this leather dress more attractive. This is mini leather dress and it has side zipper pockets. This designer women leather dress also has long sleeves and it has soft lined which will give you comfortable feeling when you wear it. 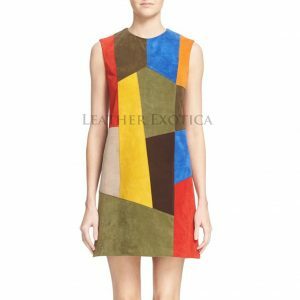 This designer women leather dress is available in all colors and all sizes. Buy this designer looking women leather dress and get unique and classy look.